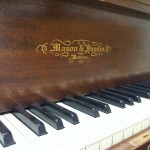 This summer Haverford High School’s chapter of the Tri M Music Honors Society is raising money to restore the school’s two grand pianos to their former glory: a Mason & Hamlin and a Lester Grand. The “Fund for the Keys” fundraiser will kick off with an alumni concert on Saturday, May 30th and will continue throughout the year with the goal of raising $25,000 to restore the pianos. They can’t speak, but if they could they’d tell countless stories of musical triumphs. Of choirs that became families, and award winning orchestras that first lit a passion for music in young audience members who would one day grace the stage themselves. Haverford’s music department is both renowned and beloved (boasting nationally and internationally recognized band, orchestra and choral ensembles), and the school’s Mason & Hamlin is at the heart of that program. A prized instrument of both pianists and music lovers alike, the BB model grand has given numerous generations of students the opportunity to perform with a true, concert worthy piano. However, after 60 years of service, even pianos get a little worse for wear, and Haverford’s students are rallying togetherto give back to the program that first inspired their love of music. The repair costs sound steep, but they’re a small price to pay considering the school will have to switch to electric keyboards if these great instruments can’t be repaired. The pianos give students the opportunity to learn on inspirational instruments that reflect their own abilities, and electric keyboards are no substitution. From competing in invitation only choral competitions in Veszprem Hungary, to working with the Philadelphia Orchestra Concertmaster, David Kim, Haverford music students are inspired to reach their full potential by a dedicated staff. It’s a tradition that brings communities together, and consistently turns out students who remember Haverford High School as the place where their love for music was first given a voice. Helping to restore the pianos is a way that students can say thank you to a program that has given so much to so many students over the years, and both current and former students are rising to the occasion.